Agora is the word, Agorafobia is originated from. Agorafobia is the opposite of Clostrofobia which is the fear of going to closed areas. Agorofobia is the fear of going to open areas. Agoras were places where people gathered. Ephesus such a big city had 2 agoras. One is used for political reasons the other one served as a market place for commercial reasons. The State Agora which also today known as the Political Agora was a vast public square laid out and remodeled during the reign of Augustus (27 BC-14 AD). It was a public area where people gathered for political and social reasons. It was bordered by stoas on three sides and decorated with sculptures. Stoas were one side wall one side collonaded roofed structures, providing shelter during rainy days and hot summer days. In these stoas some days philosphers were giving courses to their pupils. In the center there was a temple dedicated to the Egyptian godess Isis, built for the visit of Marcus Antonius and Cleaopatra in 42BC. Pink granite columns are the remains of the temple dedicated to Isis. Since there are no quarries in Anatolia for pink granite. The pink granite pieces seen are the proves of a relation between Egypt and Ephesus. All major laws and decisions were voted in this chamber. On the side of the State Agora a big cistern can be noticed. 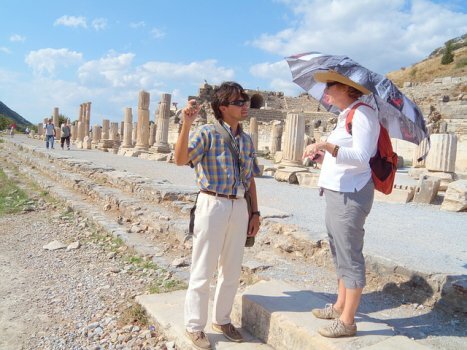 Water used to be carried to the city by Aquaducts & terra cotta pipes from several sources around Ephesus. Clay pipes can be noted. They are approximately 1500 years old. Had a locking system and glued to each other with a mortar mixture of clay dust, marble dust and egg white. We know that Romans also used lead pipes and found out that lead is against health therefore continued using clay pipes. Plumbus is the greek word for pipe where the word Plumer is also originated from. Before the Lysamachus settlement, the cemetery (Necropolis: meaning the city of deadth) of the old city was located here. It was one of the reasons why people refused to move the new city. During the Roman period the cemetery was moved. The symbol of Ichthys can be seen by the visitors on the side of the State Agora. It is an early christian symbol before the cross. According to some biblical scholars why Jesus was crucified, was not identified for many years. Early christians used the term Ichthys which is the word for fish in the ancient Greek. Ichthys is written as above picture in the Ancient Greek. A word formed from the first letters of several words. It compiles to "Jesus Christ God's son Savior" in ancient Greek. * I is the first letter of Iesous, for Jesus in ancient Greek..
* X (ch) is the first letter of Christos, for Christ in ancient Greek. * Theta (th) is the first letter of Theou, for God in ancient Greek. * Y (u) is the first letter of huios, for Son in ancient Greek . * Sigma (s) is the first letter of soter, for Savior in ancient Greek. 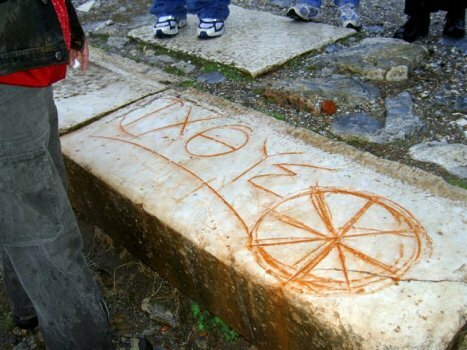 Why this stone piece located caused a suspission among many archeologists. Many think that this piece is belonging another structure and misplaced at later years due to an earthquake or a battle. Late 3rd century was the transition period from Pagan world to Christianity. Many early christians added christian symbols on the buildings, mainly pagan temples to christianize them. After 4th century, after christianity becoming the state religion of Roman Empire. Instead of going to a quarry and cutting a stone, many reused the stones for the construction of their new structures like this walkway. out justice, judged the court cases and solved the disagreements between tradesmen. Basilica was also providing gathering opportunities for the people. This was a roofed rectangular building. The word basilica is originated from the Greeek word Basileus which is the Greek word for Ceasar. Basilica meaning the Ceasars Hall. Since it provided gathering opportunities, the word is adapted as a church after 4th century after Christianity beacoming the state religion of Roman Empire..
Odeon name is drived from the word "ODE" which means lyrical poem in Anciant Greek. 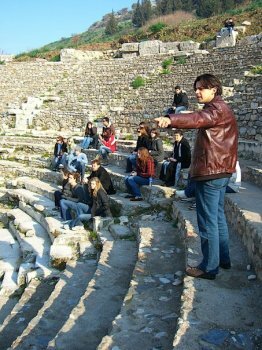 The Odeon in Ephesus was built in the 2nd century AD and had a double function. First it was for musical performances as well as being the Bouleterion. Bouleterion meaning the Senate House which was used by the boule (senator), the advisory council of the city. It was a two-storied building covered with a wooden roof with a seating capacity of 1400 people. It consisted of three main sections; cavea, skene and proskene. The Boule held all political, executive, religious and justical power. Its responsibilities were to manifold: the counstruction of temples, theatres, baths, the collection of taxes and control over the running of public buildings. Ephesus was adminstered by its own senate who were elected each year by the Advisory council. There were many concerts in the Odeion, mainly on feast days. The tiered seats were divided into two sections by a circular ambulatory known as a "diazoma". Seats in the lower section were for important people and were wider than the upper ones. Among the upper seats there are circle gaps for late comers. These are called "Vomiterium". Vomit is the greek word for mouth. Vomiteriums are shaped like an open mouth. According to some English word Vomit is also originated from these mouth looking arch entries. Below please listen an Ancient Greek Ode to give you an idea of the musical performances held at the Odeon in ancient times. The Prytaneion was the official administrative building or the city hall which housed the senior city officials. Can be translated to English as the presidency of the city. Prytarion had to approve all laws and decisons made by the advisory council. 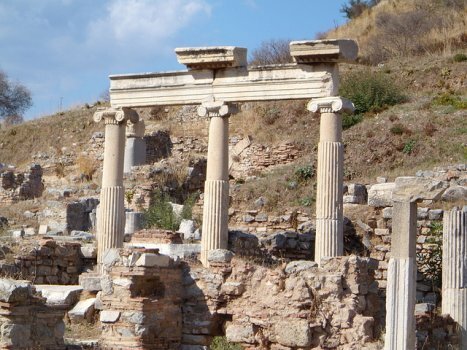 What characterized a prytaneion building as different from a bouleterion was an eternal flame or the sacred hearth of Hestia (Vesta - goddess of hearth & fire) in the prytaneion which is kept burning eternally by the Curetes, the six priestesses of Hestia (vestal virgins). The flames were taken from the Mount Olympos when a new city was founded. In Turkey there are 7 mountains having the name Olympus. The real one is close to Antlaya where there is a natural flame coming through the rocks. From an architectural standpoint it was like a private house. It contained an assembly hall, administrative rooms, the state archives and a dining hall in which officials and foreign visitors were welcomed. In front of the assembly hall there was a Doric courtyard. Some of the stones of the prytaneion were used in the restoration of the Scholastica Baths. Three statues of Artemis, "big", "beautiful" and "small" were found there. One life-size and the other double life-size Artemis statues are kept in the Ephesus Museum in Selcuk. Between Prythaneion and Memnius monument visitors will notice a ramp named as the Holy Ramp or known as the sacred way. Providing access to the Temple of Artemis. Chariots used to run on this ramp. Chariot rods can be seen. There are also traces of a street torch. A torch was used here, not only to lighten the streets but for sailors as well serving like a light house. Once the sailors see that torch is off than they understand something was not going right in the city. Olive oil and salt was used for torches. In the Ancient times only 4 cities had these kind of torches: Rome, Antiochia, Alexandria and Ephesus which were the largest cities of Roman Empire. Since some portions of the city was lit up, rich people were escorted by their slaves at dark. Slaves used to carry a fennel stick for lighting flame. In mythogy Prometheus the rival of Zeus used also a fennel to steal fire from Mt. Olympos. Zeus hid the fire from humans to avoid them to cook meat however Prometheus cheated Zeus and stole fire and distributed back to humans. When Zeus saw that fire is again used by humans He punished Prometheus. He chained him and sent him to Caucasian mountains where two eagles ate his liver. given to these structure. Originated from the name of Asclepius, meaning the temple of curement. Rufus is the one who invented the stitching in operations. Translation of some of his inscriptions and some of the medical utensils are displayed in the Archeological Museum of Ephesus.